UFO sighting above Fresno. This was just submitted to us by our reader. A video in a time-lapse mode taken from a pier in South Carolina appears to show strange lights above Myrtle Beach. The video was posted to the Mutual UFO Network website, showing multiple lights hovering in the dark sky above the resort town. According to the one who submitted the video to MUFON, they were taking photos and a time-lapse of a thunderstorm off the edge of a long pier after dark. They did not notice the objects until they returned home and checked the photo and video. Since the video was taken after dark, no reflective surfaces around can be discerned. The same video was posted on another website late last week, but the person said they shot the time-lapse on August 5. UFO Zone also published the video to YouTube, calling the sighting a massive spaceship. 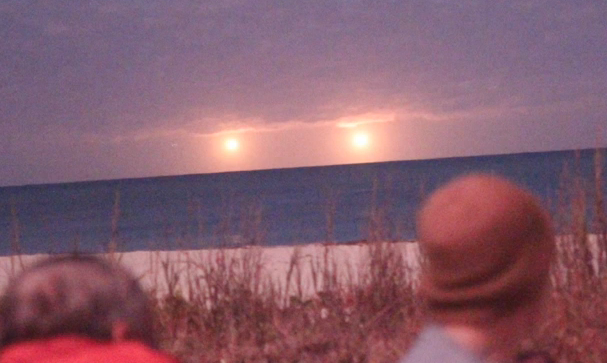 The picture above of two great fireballs in the sky is from Vera Beach, Florida of a CE-5 event. That is where the viewers had been visiting with our extraterrestrial elders from space and agreed ahead of time to meet there. Might those be two hydrogen bombs in a controlled burn off? Here is a link to a video at you tube for your consideration. Check it out and see what you think?